The holidays are filled with a never ending stream of errands, parties, people, and eggnog. If you’re a gamer, then you might be hoping that this holiday season is filled with cards, dice, and lots of cardboard along with all the other Holiday trappings. Hopefully our list of the Top 6 Big Group Games to for the Holidays will give you some new ideas or at least help you reconnect with some old favorites! Codenames is a team based word guessing game with a light spy vs spy theme. 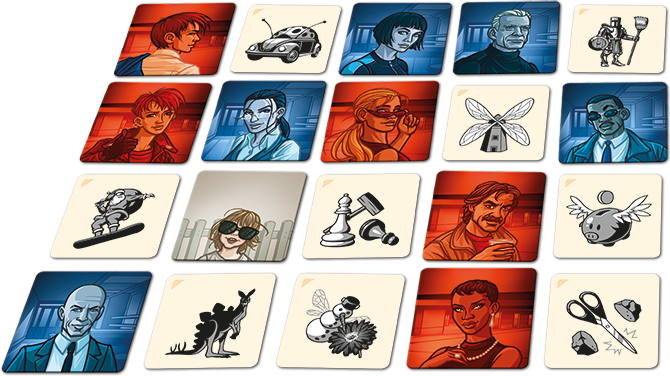 In Codenames, two teams of players are each led by a spymaster. Each Spymaster offers clues to their team that help them to guess which cards from a central shared playing area might be theirs. The spymasters share a “key” which tells each spymaster which cards belong to their team. 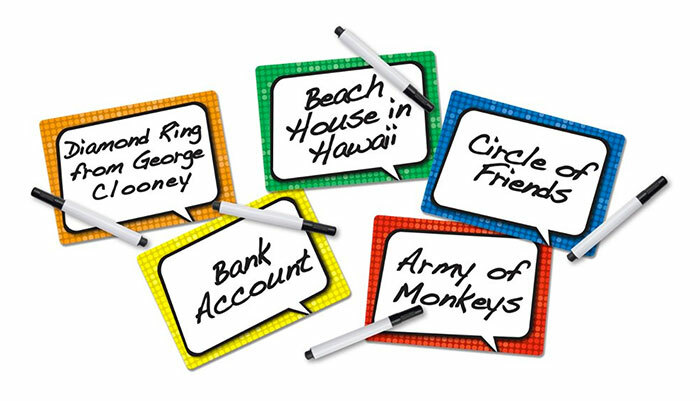 Spymasters provide clues consisting of a single word and a number indicating how many of the cards on the table match that word. For example, Japan 2 might match Godzilla and ninja. That team then has the chance to guess which cards the spymaster is referring to one at a time. Play continues until one team has correctly guessed all of their cards, or accidentally guessed the location of the hidden assassin. I first played Codenames right before Thanksgiving in 2015. It made such an impact on me that I ordered a copy that night and had it mailed to my in-laws house so that we could play it over Thanksgiving. Codenames is light, fast, easy to teach, and fun. Even my 8 year old son can play. 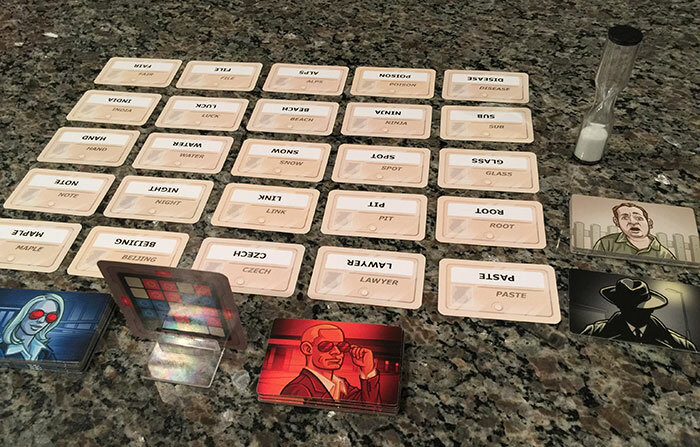 It’s also worth mentioning that Codenames: Pictures was recently released. This version replaces the words with delightfully bizarre, oddball illustrations while keeping the simple gameplay of the original. Say Anything is a party-style game that takes the familiar “pick the best answer” mechanic of games like Apples to Apples and turns it on its head. Each player has a dry-erase board and marker where they can write anything. One player is determined to be the judge for the round. They select a question from a card and read it to the group. For example, “If I could have a ‘BIG’ anything, what would it be?”” The other players then submit an answer by writing it on their dry-erase board. The twist is that the judge picks their favorite answer in secret. Each player has two betting chips that they can place on the answers that they think the judge could pick. In most games that have a judge, there is a common problem where the player who knows the judge the best will often win. This game mitigates that problem with the betting chips. Say Anything is an absolute riot. Since players can write whatever they want, it naturally adapts to your playgroup. I’ve played this with family, friends, and gamers alike. The questions are cleverly written to allow for as much creativity and ridiculousness as players want to have. I have yet to play a game where we haven’t’ broken out in bouts of uncontrollable laughter. Spyfall is a light social deduction game where players ask each other questions to determine who is a spy, usually to hilarious results. Players are dealt a card that either has a specific location and role or simply says “Spy.” Players take turns asking each other questions about their location and role. The spy tries to figure out the location on the player’s cards while the other players try to figure out who the spy is. Players want to be specific enough to let everyone else know that they are not the spy, but vague enough for the spy to not figure out where they are. Games are timed to last no more than 8-10 minutes, but at any point a player can accuse another of being the spy and call for a vote. If the group unanimously agrees that the accused player is a spy, that person has to reveal their card. If the accused player is a spy, the group wins. If not, the spy wins. The spy can also win by revealing themselves as the spy and guessing the group’s location. This game is loads of fun. I’ve never played a round in which people didn’t instantly say “Let’s play again.” Since each round only take about 10 minutes, it’s easy to end up playing three or four games in a row. 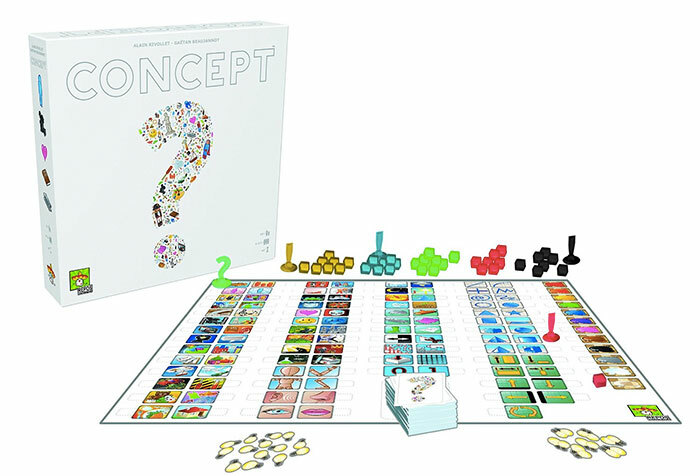 Concepts is a game that joins charades with the scientific method. In Concept, one player (or a team) places plastic pieces onto an icon-filled board in order to help the remaining players guess a word or phrase. The active player uses a green question mark pawn to indicate the main concept and green plastic cubes to indicate supporting concepts. If further information is needed, players can introduce subconcepts by adding exclamation point pawns along with more supporting concept cubes to other spaces on the board. When the concept is guessed correctly, the active player receives one point and the guessing player receive a double point marker. Play continues until all 12 of the double point markers are gone. Concept is super clever with bright colorful pieces and fun icons. 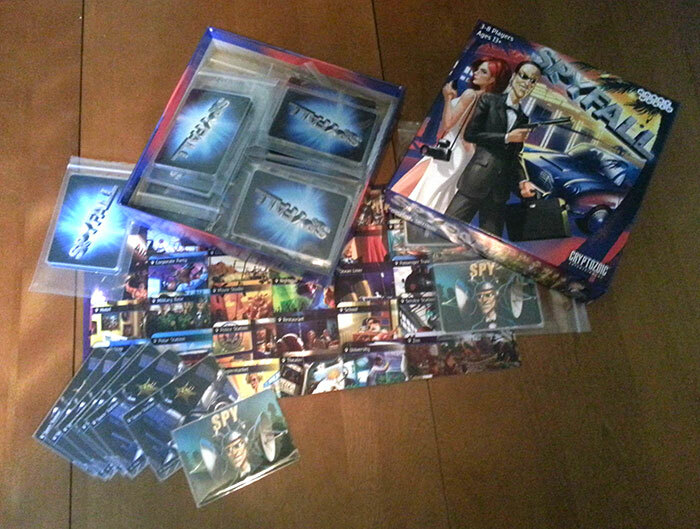 It includes a large deck of cards, each containing 3 clues in each of 3 categories. Concept offers loads of replayability and can even be played without scoring if your family just wants to have some laughs! Las Vegas is a dice rolling, money grabbing, area control masterpiece. On a player’s turn they will roll all of their dice and separate them by value. They will then select all dice of one value and place them onto a casino tile. Players take turns doing rolling and placing dice until they have all been placed. Once each player has finished placing dice, rewards are distributed. The player with the most dice on each casino wins the largest reward, the player in second place wins the second highest reward, etc. There’s not much more that I can say about Las Vegas that I haven’t already said. 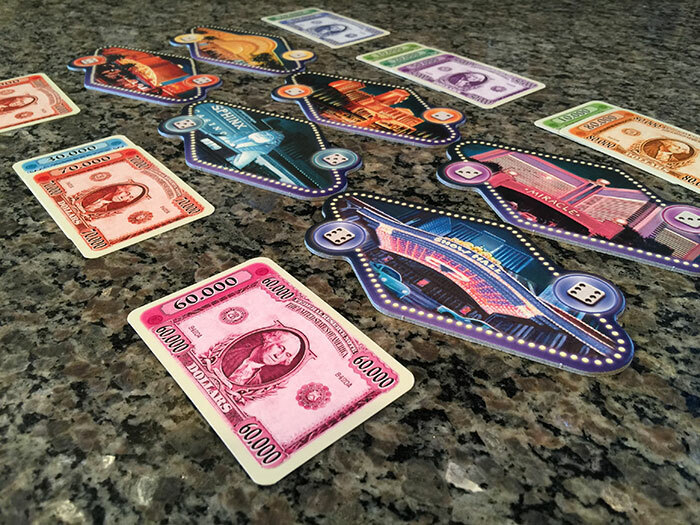 We We reviewed Las Vegas earlier this year and it continues to delight. In fact, there were 3 simultaneous games going on at last month’s Nashville Game Night! The Boulevard expansion allows groups to play Las Vegas with up to 8 players using the additional 3 sets of dice. 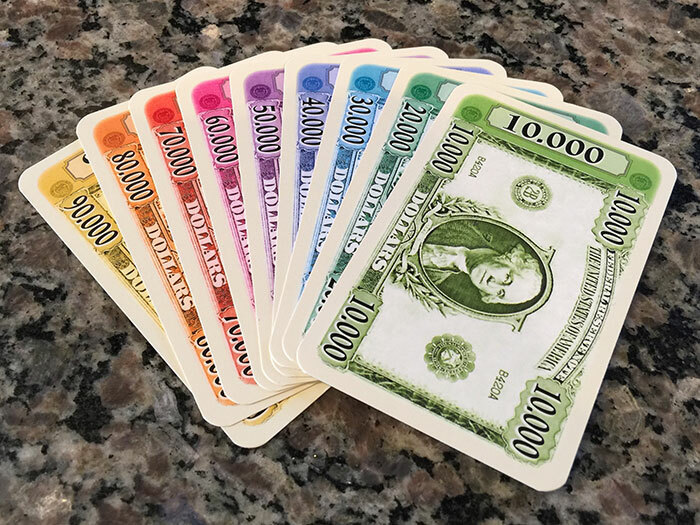 Las Vegas Boulevard also includes a number of mini-expansions: higher dollar amount reward cards, giant sized dice which count as 2 when determining control of casinos, purple dice which allow players to “kick out” another player’s die from a casino, and end of game bonus cards. Las Vegas Boulevard is currently only available in Europe and can be a bit pricey. In fact, I had to ask a Twitter friend to bring a copy back from Germany for me. If adding players is the one part that really attracts you to this one, you can always just bring over a set of dice from another game! The base game is wonderful without the expansion, but if you have the chance to pick up Boulevard you won’t regret it. Even without the expansion Las Vegas is a MUST have for any gamer’s shelf. Check out our full review of Las Vegas. Camel Up is a wonderful game about camel racing. The twist in this game is that you don’t actually play the camels. 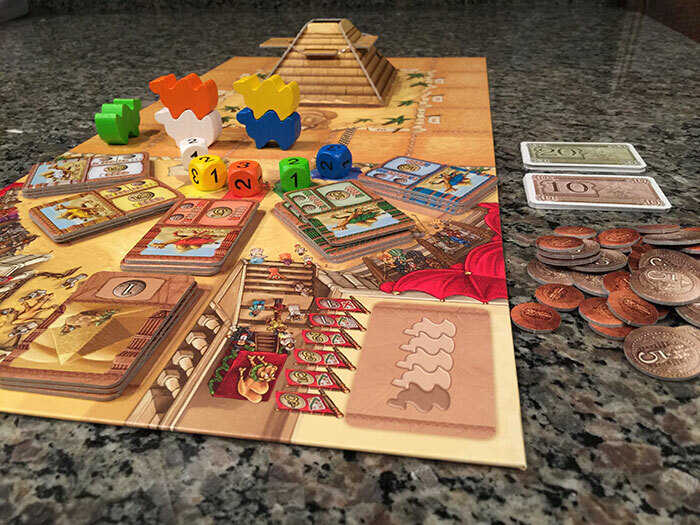 In Camel Up each player takes the role of a wealthy race fan betting on the five brightly colored, chunky, stackable camels as they race around a large 3d pyramid. In Camel Up, players must choose whether to advance camels on the board or bet on which camel they think will win the race. Players can make large bets on the overall winner (or loser) of the race or smaller bets on which camel will come in first or second in each leg. Camels advance when a die matching their color is rolled. The unique thing about this game is that when a camel advances any camel on top goes along for the ride. This means that you’ll never be quite sure if you’re backing a winner or not. For some reason I avoided playing Camel Up for years. I’m sorry that I did because it’s great fun. The components and artwork are great, and the gameplay is unique. Camel Up offers a bit of push your luck since you’re forced to choose whether you want to advance the camel or bet on it’s success. You’ll never be sure that play will make it back to you before the end of the round, so you have to plan ahead. I strongly recommend you give Camel Up a try. You won’t regret it. Games can be such a great way to bring families, and even strangers, closer together. They help people open up, laugh, and even talk about the difficult subjects in life (like whether to have cake vs pie for dessert). Hopefully this will help you find a game or two that might bring your family and friends closer together over the holidays! 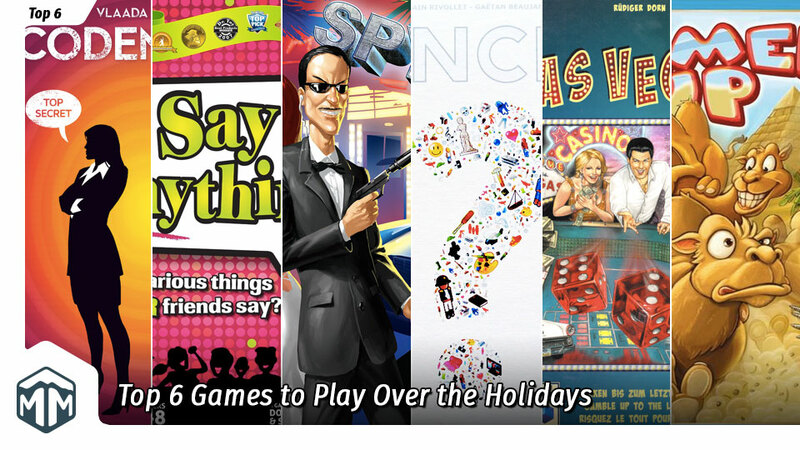 What do you think about our list of Top 6 Games to Play Over the Holidays? Give us your opinions in the comments below! Recruiter by day, board game enthusiast by night. Despite controversy, i’m a firm believer that collecting can be just as fun as playing games. My favorite aspect of the board gaming hobby is its ability to bring people together in a meaningful way.